“In 1919 Maksakova made her début as Olga in EVGENY ONÉGIN. In the autumn the baritone Max Maksakov arrived at the theater as a new director (and soloist) and gave her several new roles. Much admiring her gift, the maestro was still critical of her technique, so she went to Petrograd for further studying. There she met Glazunov who recognized a lyric soprano in her and opted for a return, to ask Maksakov for private lessons. The two became close, he proposed, and in 1920 they married, forming a sparkling duet on stage. In 1923 Maria Maksakova came to Moscow, débuted (as Amneris) substituting Obukhova, who fell ill, and was instantly invited to join the ensemble. In 1925 Maksakova moved to Leningrad's Mariinsky Theatre. In 1927 she returned to Bolshoi, where she continued to work as a leading soloist until her retirement 1953. In those years she sang virtually all the leading female roles in the Mariinsky's classic repertoire. Maksakova was one of the first Soviet artists who were allowed in the mid-1930s to perform abroad, giving successful concerts in Turkey and Poland, later Sweden and (after the war) East Germany. 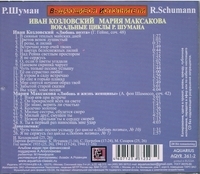 In 1944 Maksakova won the 1st Prize at the Russian Folk song competition held by the Arts Committee of the USSR. In 1946 she was awarded her first Stalin Prize ‘for outstanding achievents in opera and the performing arts’. Two more were to come, in 1949 and 1951. In 1953 Maksakova retired or, rather, was informed of her retirement which came as an unpleasant surprise for a singer who had kept herself in superb shape, both physically and artistically. Rumours had it that some people at the Bolshoi found it safe to settle old scores now that Stalin, her much-feared patron, was now dead; specifically, the name of Vera Davydova, another famous Soviet soprano, has been mentioned. ‘Our relations were pure and friendly, each respected and valued what the other was doing on stage’, Davydova maintained."